BONNEVILLE, Ore. -- It wasn't until the door of the floating cell slammed shut behind them that the sea lions started to chant. "Ong?" they shouted. "Ong? Ong? Ong? Ong? Ong? Ong?" But when, an hour later, the crane started lifting their cages out of the water, 40 feet or more and into a waiting horse trailer, the pinnipeds were silent. And that, more or less, was how C-319 and C-739 became the first California sea lions permanently removed from the man-made seafood buffet beneath the Columbia River's -Bonneville Dam, 145 miles from their home in the Pacific Ocean. To them, the traps just looked like "a flat place to lie down," a state spokesman said. Now, the trapped beasts are bound for Sea World, shipping and handling payable by addressee. Thursday's haul was eight. 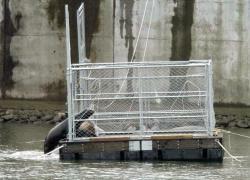 Two were endangered Steller sea lions that had to be freed. C-319 and C-739 had brands identifying them as among 61 that federal authorities had marked for immediate removal and the status of one is uncertain. The others were unbranded or branded and not targeted for removal. Those will be hauled to the mouth of the Columbia River and freed. Sea lions that finish the long upstream swim to the dam usually gulp down about seven salmon a day, watchers say -- two more than human sport fishers are allowed to take home all year. Since sea lions apparently stumbled upon the dam during 2001's big salmon run, up to 100 a day have been seen at the site during migration season. C-319 himself had been showing up since at least 2003. C-404, the Houdini-like seal who made headlines in 2006 by squeezing through $1 million worth of steel barricades to enjoy the meal inside the dam's fish ladders, is apparently still at large. The government workers who watch the sea lions' feast know the repeat offenders by sight and have probably given some of them names, said Craig Bartlett, a spokesman for the Washington Department of Fish and Wildlife. If so, those names are a secret. If the public ever starts associating names with these marine animals, Bartlett said, his office will be in trouble. Adult male California sea lions -- this far upriver, they're all males -- usually weigh 600 to 1,000 pounds. A few weeks in Bonneville during salmon migration tends to push that number up. Sea World is likely to market the mammals as having been "rescued" from beneath the barrels of guns, Bartlett said. That's not quite true: A federal court forbade the killing of sea lions on Wednesday, saying that letting predators hang out at the dam for another season won't do "irreparable harm" to this year's run. The Humane Society of the United States and other groups object to killing and trapping the predators. The Ninth Circuit Court of Appeals will hear the case next month and issue a ruling after salmon season ends. More trapping will occur next week. Ion Pop, a sport fisherman looking for sturgeon beneath the dam Thursday, called the whole thing a waste of money. "You shoot 10 of them today, you aren't going to see a sea lion tomorrow, because they are very intelligent," said Pop, 57, of Portland. But simply trapping a few beasts won't make an impact, he believes. "This ain't going to take care of the problem," Pop said. "They will be back next year." Pop said he caught his full quota of five salmon before the season ended on Sunday. As for the Humane Society's view that human fishing, pollution and dams are more to blame than sea lions for the salmon decline, Pop just snorted. "There's no question of that," the fisherman said, looking across the water to the misty hills above the Columbia River Gorge. "We were born in the (expletive) Garden of Eden. That wasn't good enough for us. But where do we go from here?"